The Congress president said that PM Modi lied about different things in different states & has no credibility left. 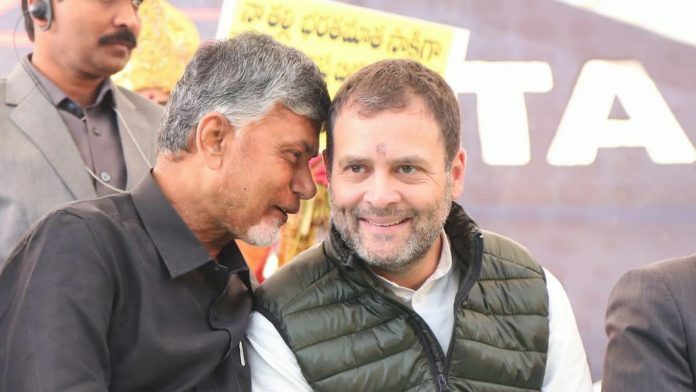 New Delhi: Expressing support for Andhra Pradesh Chief Minister Chandrababu Naidu’s daylong fast, Congress chief Rahul Gandhi on Monday alleged that Prime Minister Narendra Modi had stolen from the people of the state and given the money to industrialist Anil Ambani. The TDP president is on a fast here demanding that the Centre fulfil all promises made during Andhra Pradesh’s bifurcation in 2014 and alleging that the prime minister was not following ‘raj dharma’ by denying the state special status. “The prime minister has stolen from the people from Andhra Pradesh and he has given that money to Anil Ambani. That is the fact of the matter,” Gandhi said at the venue of the hunger strike in Andhra Bhavan. The government and Ambani have rejected Gandhi’s allegations of corruption in the Rafale fighter jet deal with France. “Mr Narendra Modi, wherever he goes, he goes to Andhra Pradesh, he lies about special status. He goes to the North-East, he tells another lie over there. He goes to Maharashtra and he tells another lie over there. He has absolutely got no credibility left,” Gandhi said.